WebsiteBox has released a new, improved version of its powerful website tech tools based on customer feedback gathered over the past 10 months. The WebsiteBox website upgrade is just the latest step in keeping with the company’s commitment to innovation. Innovation is the foundation of our company. WebsiteBox, a leader in low cost, do-it-all real estate website packages, has released a new, updated version of its powerful, mobile-friendly website technology program designed for the real estate industry. 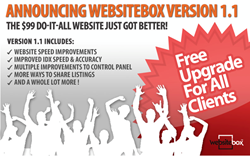 Version 1.1 incorporates improvements to the original version based on customer feedback gathered by WebsiteBox since launching in January 2013. According to WebsiteBox CEO Peyman Aleagha, the program upgrades will give customers the edge they need to maximize growth in today’s competitive real estate industry. Improved IDX speed & accuracy. Social media integration with Yelp, Google Plus and Instagram. Ability to share listings via Pinterest. Multiple improvements to the backend control panel. Ability to duplicate websites with ease. Image management system for uploaded images. User interface improvements for the Lead Capture App. Ability to track where customers came from in the CRM. Ability to create new categories for communities. Automatic creation of single communities. Additionally, WebsiteBox recently launched a community forum at community.websitebox.com for customers to ask questions and share ideas with other WebsiteBox users. WebsiteBox Customer Success Manager Travis Humphrys says the upgrade is the result of the company’s diligence in tracking customer feedback since day one in order to deliver the tools they need. “We listen carefully to our customers’,” says Humphrys. “The feedback we get from our real estate agent clients guides us in developing, maintaining and improving the powerful tech tools they need to make their business better. For more information, visit the WebsiteBox website, email chad.bhalla(at)websitebox(dot)com, or phone 1-866-857-1657 x 113. Launched in January 2013 by Internet entrepreneur and real estate marketing expert Peyman Aleagha, WebsiteBox is a Toronto-based startup offering feature-rich, mobile-friendly real estate websites and tools for agents, teams and offices at a one-time, $99 price – the lowest in the market. WebsiteBox is quickly gaining prominence in both the real estate and entrepreneurial markets. Less than six months after launching as a real estate technology startup, WebsiteBox™ was named to HousingWire Magazine’s inaugural RETech:50 list of top real estate technology firms for 2013, and has been nominated for the prestigious 2013 Inman Innovator Award.